Whenever there is an obstruction to you reaching the ball, whenever your opponent doesn't let you reach the ball that you would have otherwise gotten, a Let is decided and the rally will be Re-done with the previous score and the previous positions. Therefore a Let is assigned if your opponent doesn't allow you to reach the ball when it is your turn to do so, that's probably cause he will be inside of your movement trajectory. If you move toward a direction, then move toward the actual direction of the ball but get obstructed by your opponent and don't reach the ball, you will not receive a let. For a Let to be assigned you must have chosen the right direction toward the ball in the first place. I.E. if you don't move for the ball in a proper way, you will not receive a Let, even if your opponent is in your way. What I mean is that you must know where the ball is going and move properly, also you must realistically be able to reach the ball. If you by making a boast that would reach the front wall, hit your opponent with the ball. If a potentially dangerous situation occurs such as when your opponent is close to you and you are not sure exactly where he is. Whenever there is an impediment to you making a winning shot, caused by the fact that your opponent is in front of you or inside of your racket swing space. A point will be assigned to you. This judgement is called stroke. A winning shot is a shot that goes directly into the front wall. Therefore everytime your opponent throws a shot near himself, and you are behind him, you will receive a point and a stroke will be assigned against your opponent. If you hit your opponent. if the conditions for a stroke are applicable after the ball bounces away from the back wall provided that you don't rotate yourself (I.e. you keep facing your opponent, this typically happens if your opponent makes a really terrible shot). If your opponent is inside of your swing when you are making the shot. Squash have few simple rules. Let and stroke and the distinction between them is probably the most important. I made three videos: A simple quickstart and two in depth on both Let and Stroke. Let is about restarting the rally because your opponent didn't Let you go for the ball or some interruption occurred. Stroke has to do with impeding the shot, your opponent didn't allow you to make you shot by staying inside of your swing (which is a risky thing to do) or by placing himself inside of your ball's trajectory. What should you do if your ball comes back to the center. This is the other side of the perspective that i talked about in the Triangle Theory Article. What i believe is that you must always move in a way that allows you to rapidly come to the center, whenever you throw a ball that comes back to the center you must run twice as fast and surpass your opponent and stay to his side so that if he makes a drop shot you can retrieve that ball. Of course by doing so you will be at risk if your opponent makes a perfectly calculated drive, yet it is better to counter with a slow defencive boast than to give the point right away if your opponent makes a drop shot. The idea is that you must be in the nearest place to the center. Physically talking if your opponent is in the center you cannot go there, but you can come as close as you can to it if you go over your opponent to his side. From that position you will have many more choices than to wait behind your opponent. In fact the more you are stale on your feet the harder will be for you to move. Instead from up in the court you will have a chance to forestall your opponent's shot (if he makes a drive), you will easily retrieve a drop shot and if your opponent makes a cross court you will actually gain an advantage. Squash is a fast paced game and you must first understand this game in order to play it well. The centre is the nearest point to all the corners, when you are playing such a good squash that you are leading the game you will find that you are in the centre most of the time. Yet playing well is useless if you don't have the habit of always coming back to the centre no matter what. You see, if you don't always try to come back to the centre, there will be a time in which your opponent (by seeing you) will capitalise on this occasion and score. When i talk about coming back to the centre i don't necessarily talk about going in the T.
There are times in which staying in the T can be harmful, for example if you make a strong drive that bounces high off the back wall. Anyway although you don't always need to come to the T you must always stay in the centre relative to the side walls. This is because you are always just one step from the side wall. Instead if you stay in one side of the court you are giving aways a great advantage to your opponent. So as i teach you in my court movement tutorial: Always come to the centre relative to the side walls, and eventually come to the T.
The drive is the meat of this game. By properly using this shot you will always force your opponent on the back of the court. What you must understand is that the drive is not necessarily a shot made to score a quick point, it is a shot used to build your game. Use it as a foundation. You always make a drive, no matter what your opponent makes. This way your opponent will have to go into the back corner and you will be able to control the centre of the court. When you are in control of the T and therefore in control of the game you just have to keep using the drive until your opponent makes a bad shot. Then it is time for the long short alternation tactic. 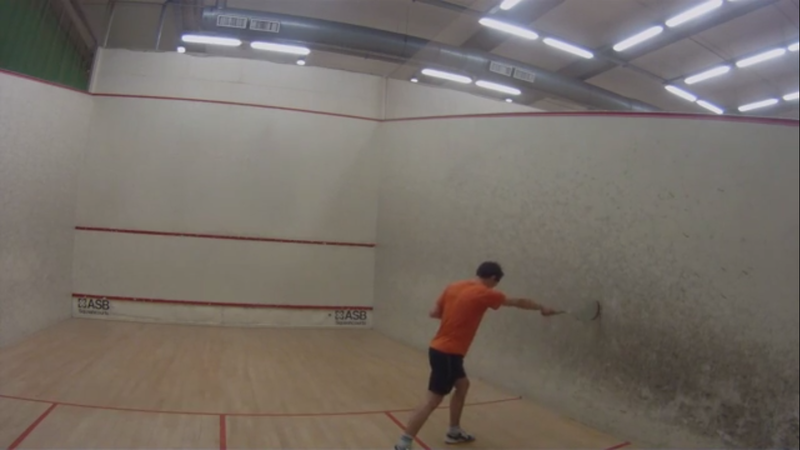 The most basic tactics of squash states: Throw the ball in the corners, always where your opponent is not. I'd change this tactic and suggest that you make many drives and whenever your opponent makes a shot that is not good (check my triangle theory for in depth explanation of the geometry behind a good or a bad shot) you simply make a drop shot. This is the most simple yet most consistent tactic in the game. Use the drive -> force your opponent in the corner -> make a drop shot. Wash/ Rinse/ Repeat. The way squash works is that you and your opponent are on what is called PAR in golf until one of you makes a shot that is better than the one of the other. Whenever this happens one player will be in disadvantage, he will actually have a little delay on the ball in respect to the player in advantage. The way the delay gets managed depends on both players. As a general rule if one player makes a great drive that is aimed at the back corner the game returns to a par or the table gets turned. What i suggest to you is that every time your opponent is in delay you speed up the game a little so that the delay will actually cause an error. When playing at a low-medium level you can watch the body of your opponent, in fact the body is a accurate indicator of which shot is going to be played. Instead when you play at an advanced level i suggest that you only watch the ball. That's because one of the pros's aim is to always fake their body communication. Always watch the ball, when you have to play it and when you have already played it. When your opponent is going to make a shot always be aware of where the ball will go. This is the crucial point. After your opponent makes a shot, you just need a millisecond to understand where the general direction of the ball is. As i suggested in the court philosophy article you should move in an way that leaves no room for error. The great new tweak i suggest you add is that when you are moving for the ball, you should turn your head to watch where your opponent is. This ways you will know which is the best shot for the occasion. To be unpredictable is hard to explain, i suggest that you make sure to alternate some shots at specific points. For example when you are near the front corner the standard moves are the drop shot and the cross court. But you can also do an attacking boast or a lob. As a general rule do two of the standard shot and then change to something else. This way your opponent won't be able to read you as an open book. If you always watch your opponent and mix things up you will find it pretty easy to dominate on court. Another shot that i love is the attacking boast when your opponent makes a cross-court or a drive. There are situations in which your opponent makes a shot that is not good enough to force you in the back and you can make the boast in the meantime when your opponent is recovering to the T.
If used with moderation it usually gets an easy point. Another shot that is surprising is the cross-court from the back wall done at the last second. If you wait to retrieve a ball from the back wall your opponent will generally assume you are going to make a boast or a drive. If you instead move your body at the last second and make a cross-court you will surprise your opponent. To wrap up i recommend you to play with consistency and always do in game what you practise in training. Don't try to be a phenomenon, because the best is the one that has all the fundamentals down. A lob is a slow and high shot that goes from that is typically done from the front area of the court and lands in the back corner. It can be done both as a drive and as a cross court. How do you make a lob? To perform a lob you first have to make sure that your racket plate is facing upwards, then proceed to aim at the highest point on the front wall and make a feeble shot. The lob is well known for the fact that if it is not retrieved with a volley it will typically score a point. In fact you have to make sure that the ball reaches the far end of the back of the court and doesn't bounce from the back wall. When Should I Make A Lob? The lob is a funny shot, and it is also lethal is properly executed. When your opponent makes a drop shot and he is behind you, in order to avoid getting a stroke, you can make a lob. This will force your opponent on the back of the court. Extra: Only for readers: Exercises for working on the lob. You can do this exercise and practise both a drive lob or a cross-court lob. The player that does the volley will have a fun and hard time trying to catch your balls, he can do both a volley boast or a drop-shot (both on the same side of the court and in the opposite side of the court). I suggest you try this exercise, it will be a lot of fun! Free 15 page E-book and Newsletter!